The evaluation phase at the end of the water loss control program is necessary to assess the results achieved by the program. 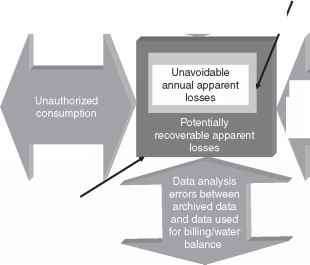 Basically a new water balance complemented by a component analysis is undertaken and if necessary DMA measurements are carried out and the results are compared to the results before start of the water loss control program. If the intervention program took place on a DMA level then it is best to repeat the DMA measurements after completion of the intervention. If a program extends over several years then it is advised to measure the results at least on an annual base to see if the water loss reduction efforts are moving into the right direction. It is important to bear in mind that once the goals are achieved it is necessary to continue with the water loss control efforts in order to maintain the economic optimum volume of water losses. This is necessary because water losses increase over time if no control measures are taken. However, the efforts necessary to maintain the optimum point will be less than the efforts that were necessary to get to the optimum point.